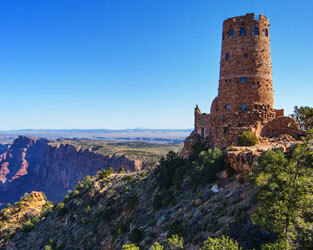 Planning a trip to explore the breathtaking sights of Grand Canyon National Park? Want to share the experience with your pet? The South Rim of Grand Canyon National Park is dog friendly, so canine companions are welcome to enjoy a scenic getaway with their families. Learn more about the National Park Service's pet rules. Where Can I Bring My Dog at the Grand Canyon South Rim? 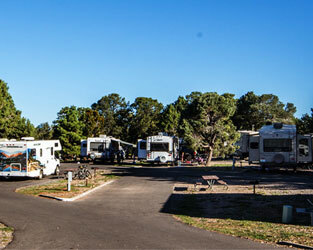 Leashed dogs are allowed on named trails above the rim, Mather Campground, Desert View Campground, Trailer Village, Yavapai Lodge West pet-friendly rooms, and throughout developed areas. There are 12 miles of trails where dogs are allowed. 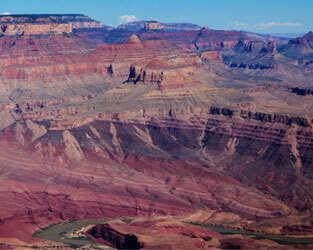 Below the rim, also called the "inner canyon." There is wildlife below the rim, and we don't want dogs to harass or be endangered by it. 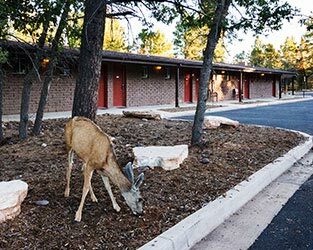 In park lodging, with the exception of those staying with their owners in a pet-friendly room at Yavapai Lodge West. The National Park Service created a great video that reviews pets in the Grand Canyon's South Rim, as well as a few tips on where to take your dog. If you plan to hike into the Canyon, a kennel is available at the South Rim that accepts dogs and cats only. It's open from 7:30 a.m. – 5 p.m. daily, and reservations are recommended. Proof of vaccination will be required to place your pets in the kennel. Kennel reservations can be made by calling 928-638-0534. Since temperatures at the Grand Canyon can soar during the day, pets cannot be safely left inside parked cars – even for only a few minutes on a summer day. Also, since asphalt can get very hot in the midday during the summer, it would be better to walk your dog in the early morning or evening. Your dog's paws will appreciate the cooler pavement at those times! It's suggested to plan ahead and accordingly for the weather conditions. Water and a collapsible bowl will come in handy! Being mindful of how far your dog is comfortable hiking will also help provide a safe and adventurous time for you and your canine companion. Dogs are always welcome at Yavapai Lodge! 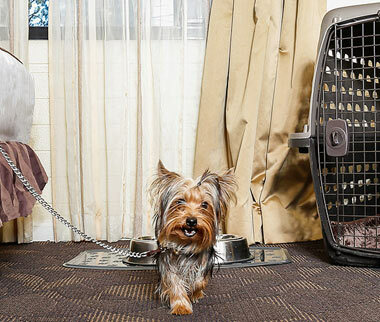 Pet-friendly rooms are available in Yavapai West for guests traveling with their four-legged friends. There is an additional $25 pet fee per day, and each room can have up to two pets. Disclaimer: Subject to availability and for new reservations only. All taxes, fees and cancellation policies apply. Cannot be combined with any other promotion, package or contract. Offer subject to change or end without notice. Blackout days will apply. Actual retail items included in package may vary. 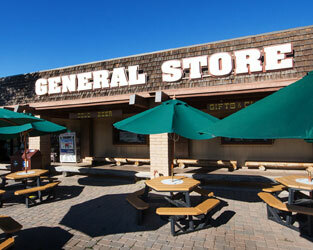 We look forward to seeing you and your pet at Grand Canyon National Park!